With more than 336 million active users, Twitter has taken the social media world by storm. Its heavy user traffic can leave you wondering, is my content even being seen? For the average user, this is hardly problematic. However, for brands and marketers, reaching the correct Twitter audience has become challenging. But, the rise of social influencers has given brands the opportunity to step out of the marketing box and put on their creative hats. From a marketing perspective, it makes sense to call upon the so-called “high [social media] influencers” to help gain visibility and brand following. But, how influential are these influencers? To find out, Experian examined three of the top beauty/lifestyle influencers on Twitter who have made their mark on the social world. Some might be saying, “Hold up, what is a high influencer?” According to Experian, a high influencer is considered to be any user with 1000+ followers. In today’s social world, more followers equal more views and more interactions. For brands and marketers, it makes sense to enlist these high influencers as a part of their marketing strategy to help push their messages and content to their desired audiences. The beauty industry has done an exceptional job of using high influencers as their own personal army of brand ambassadors. We examined Zoella, James Charles, and Jacilyn Hill, who all ranked among the top beauty influencers on Twitter and hold an impressive, combined 16.3 million followers. 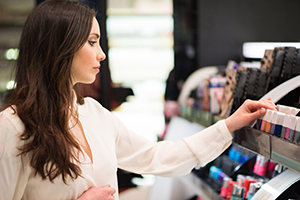 With an oversaturated beauty market, it is important for beauty brands and marketers to think outside of the box. Using influencers like Zoella, James Charles, and Jacilyn Hill, allows brands to communicate with their target audiences at a fraction of the cost, and with better results. For example, Twitter users following the selected high influencers are more than five times as likely to mention Sephora, more than six times as likely to mention Ulta Beauty, and on average follow more than eight beauty-related accounts. Ulta Beauty, Morphe Brushes, Becca Cosmetics, Marc Jacobs, and Bellami Hair are among the top brands followed by these beauty obsessed Twitter users. Although we can only examine a small portion of the data relating to the beauty industry, there is no denying the impact that high influencers can have on Twitter and other social media platforms. Our social media analysis also examined the core demographics of those who primarily engage with the selected high influencers to help narrow down their custom audiences. The results revealed that more than a quarter of these beauty-interested Twitter followers fall between the ages of 21 and 25, with an average total age of 37.96. Women make up more than 75 percent of the audience, and more than 50 percent of the users in this group have received some collegiate level education. Due to the overwhelming amount of content on Twitter, it is as equally important for brands to understand how their users interact with the social platform as it is for them to understand their audiences. According to our analysis, beauty interested followers who are already following the selected high influencers are engaging with Twitter at the highest rates during the mid-afternoon with the highest traffic being reported on Thursdays at 4:00 p.m. local time. By using high influencers as brand ambassadors, beauty brands have hit the jackpot with integrated marketing. Brands can sponsor any number of high influencers who will then create and share content about the brand to their millions of loyal followers. This type of marketing has a mutually beneficial relationship for both the brand and the influencer; making this trend overwhelmingly popular and effective. Brands can reach their target audiences with little to no overhead costs and little creative efforts, while influencers can receive free products or services, sponsorships, and/or monetary compensation for creating and sharing content with their followers. There is no denying that high influencers are the new creative marketing weapon in the social world. With millions of followers, loyal fans, and unique content creating capabilities, brands are getting on board and are changing the way we think about social marketing. Experian leveraged its Social Media Analysis solution for this study. Learn more here.